If you have forgotten your password, you will no longer receive a new password via email, but can change your new password via a shop page. You will still receive an e-mail, but now with a secure confirmation link instead of a password. This leads directly to an input mask where you can set your own new password directly. The first time you visit the shop you will now be informed about our cookies and our data protection regulations and are asked to agree to these in order to enable the optimal use of the shop. You can now explicitly specify with each order whether or not we should pass on your email address and telephone number to the shipping service provider. If you do not wish this, you will either not receive any tracking data, or you will only receive the data via our shop and not directly via DHL or UPS. If you would like to know more about your shipment, you are of course welcome to call us at any time or send us a short email. The form of address is no longer a mandatory field. If you enter a company name when registering, you can dispense with salutation, first name and surname. Thus, from the outset, no personal data of a natural person, but only the data of a legal person – the company – is recorded. If you now also use an e-mail address such as “prooforders@mycompany.com”, you will not provide us with any personal data. Also for us the shop update offers some positive innovations. Following the discontinuation of DHL’s old Intraship service, we can now also create automatic shipping labels for parcels via the new “Send” feature of the DHL Business Customer Portal. Another new feature is that we can now digitally frank address labels for our DIN B4 envelopes using digital stamps and therefore no longer require normal stamps. This is particularly interesting for us when mailing abroad with registered mail, which used to be a tedious process at the online post office, which is now automated. And we can switch between orders more easily. The next updates are already in planning. Especially the upload area is currently being technically replanned by an external developer, because with the next update the way of embedding extensions in the shop will also change. Probably later in summer the next update will be available as soon as the new modules are available and we have been able to test them thoroughly. This entry was posted in Basics and tagged Compliance, encryption, GDPR, Update by Matthias Betz. Bookmark the permalink. Born in 1970. Owner and CEO of Proof GmbH in Tübingen. Since the 1990s, Matthias is dealing with color management, proofing, standardized lightning technology, color-consistent work and soft proofing. He is a certified PDFX-ready Expert (X-1a and X-4) and a member of the examination board for media design at IHK Reutlingen. 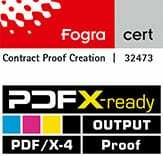 Proof GmbH is the first worldwide company certified for PSOCoatedV3 and PSOUncoatedV3 Contract Proofing.